Do you have a great business idea, product or service you want to launch in 2019? At Simboc we have access to government grant funding to help your business develop a new product or service this year using our consultancy and support services. The funding provides up to 40% towards support, consultancy and development costs, up to £24,999 for small value projects. And for larger projects, up to 30% towards the project costs to the value of £199,000. To qualify for the funding, your business will need to meet certain eligibility requirements but the process is pretty simple and we will handhold you through the application. The ideal business will be a registered company in England, VAT registered (as the VAT cannot be funded and you will claim VAT back via your normal VAT processes) and serious about development and growth of your business. Be considered as an enterprise. Have its registered head office, as per its Companies House records, within England. Simply complete the form below or drop us a quick email hello@simboc.com Our team can then arrange a follow-up discussion to answer any questions and advise you of the steps to applying for the funding. Thank you for completing the form for more information about the funding solutions we can offer. One of our experienced team will be in contact very shortly to help. Working for yourself, is it for you? 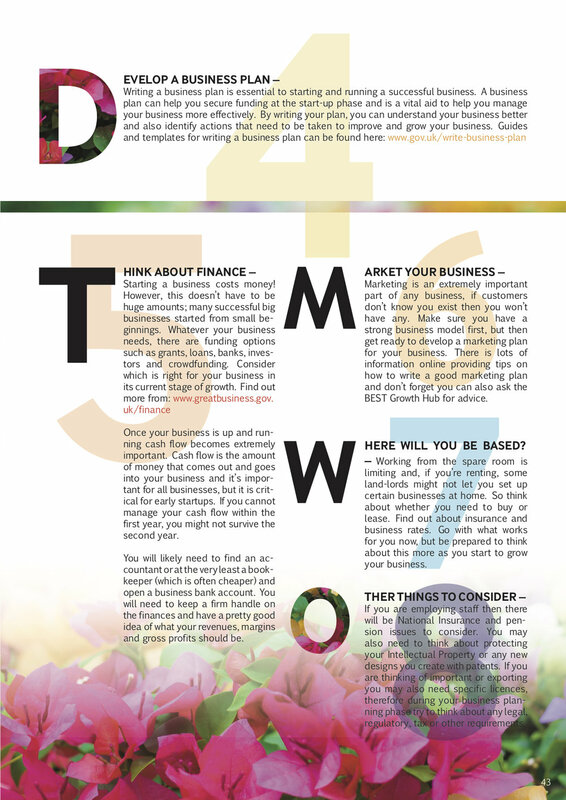 Before you rush off and open your new business, it’s important to understand what is involved in setting up a new business and how to go about doing it. We’ve asked David Bell, the regional chair for the Essex Federation of Small Businesses and ESB vice chair, to provide his expertise. David has a wealth of experience building and developing businesses. David founded his first technology business at the age of 17 and grew it into a global wireless communications provider. 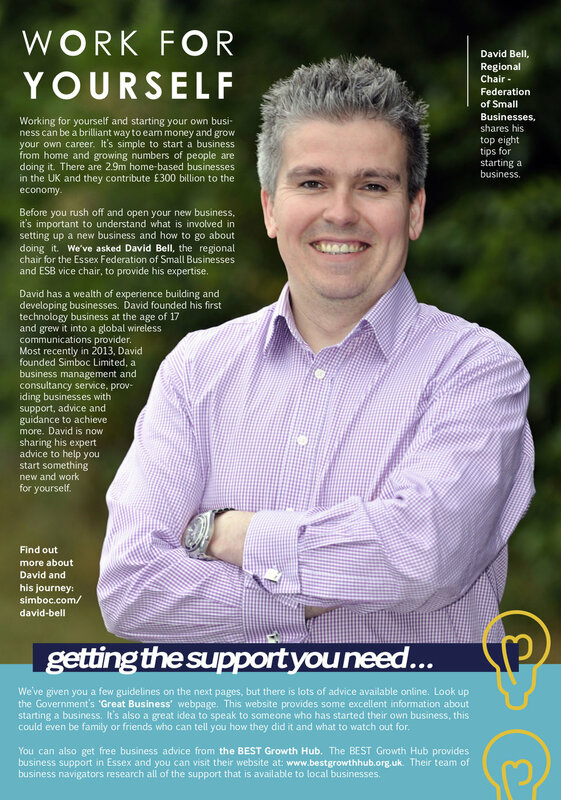 Most recently in 2013, David founded Simboc Limited, a business management and consultancy service, providing businesses with support, advice and guidance to achieve more. David is now sharing his expert advice to help you start something new and work for yourself. Want to find out more about David? - Click here to read his biography and connect with him on social media. David & Joanna the Founders of Simboc attended the East of England Business Awards again this year. The annual awards are highly acclaimed for businesses throughout the East of England and both David and Simboc were shortlisted as finalists for the third year running. The awards included a Business Champion accolade for each of the seven counties covered by the awards – Suffolk, Essex, Norfolk, Cambridgeshire, Hertfordshire, Bedfordshire and Buckinghamshire – plus a number of other region-wide awards. This year David and Joanna won the East of England Business award for Essex Business Champion 2016. Joanna commented “Wow, David and I are both over the moon to pickup another award three years running. It is really fantastic to be shortlisted again, but to win is such a awesome feeling. We must thank all our customer, supplier, partners and friends for their continued support." If you haven't heard the news already then let me bring you up to speed and quick. On Thursday 18th June 2015 TEDx is coming to Chelmsford here in Essex. This amazing event will be held at Anglia Ruskin University in the heart of the county and you have the opportunity to be part of what is set to be a day in history. TED is an annual event where some of the world’s leading thinkers and doers are invited to share what they are most passionate about. “TED” stands for Technology, Entertainment, Design – three broad subject areas that are, collectively shaping our future. TEDx is a program of local, self-organised events that bring people together to share ideas worth spreading. At TEDx events you will see TED talks videos and live speakers, which will spark deep discussion and connection. Why not visit the TED.com website. David and I are part of the elite team bringing this amazing event to Chelmsford on June 18th. The theme for our TEDx event is all about Perception and Reality. There are some exclusive sponsorship packages available and as it is such a prestigious event they are going fast. So if you are interested in becoming a sponsor for the TEDx Chelmsford event you can learn more by clicking here www.tedxchelmsford.com/partners or by emailing us. But you only have until Thursday 4th June at 5pm to register for your tickets as we will be closing the ticket applications then. The Speaker Expert, a division of the Simboc group, has just released the news that there is going to be a new Speakers Masterclass workshop starting in April 2015. The Masterclass is designed for anyone who is looking to gain confidence in public speaking or polish their keynote presentation skills. The workshop will run over one day and teach all the basics required to stand-up and present to a small-to-medium-size audiences. David will provide techniques and tips on how to make your presentation memorable, and more importantly show you how to calm your nerves before you take centre stage. The first Masterclass will take place on Wednesday 1st April 2015 at Anglia Ruskin University in Chelmsford at the Lord Ashcroft Campus.